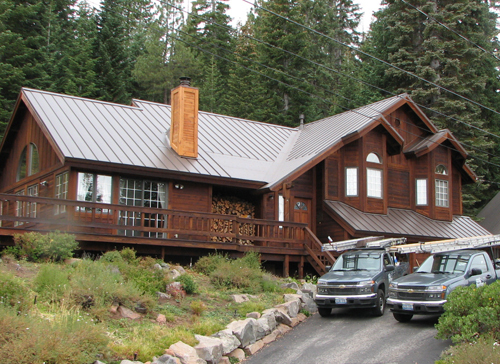 Metal roofing is by far the most durable roofing material and Mills Roofing’s specialty. Metal roofs are the best for standing up to snow and ice. Metal can be used on an entire roof or on selected sections to prevent stubborn ice damage. A variety of metal roofing types and colors are available to help complement your home’s exterior. We only use metal roofing that has been treated with a Kynar500 paint finish or the equivalent for paint fading protection. Mills Roofing Inc. has over 35 years experience in metal roofing residential or commercial projects. For a quality that will last longer than a lifetime, contact the pros at Mills Roofing Inc. for a quote on metal roofing costs. The tightening of the screws on a metal roof is one of the most neglected maintenance issues in the Truckee/Tahoe and Incline area. By just doing a screw tune up and caulking around vents on your metal roof, we will add years to its life and avoid costly roof repairs or replacement. Mills Roofing Inc will be happy to provide this service, so contact one of our estimators for a quote today.